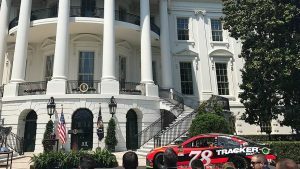 The White House honored Martin Truex Jr. on Monday to celebrate a presidential toast to his 2017 Monster Energy NASCAR Cup Series championship. 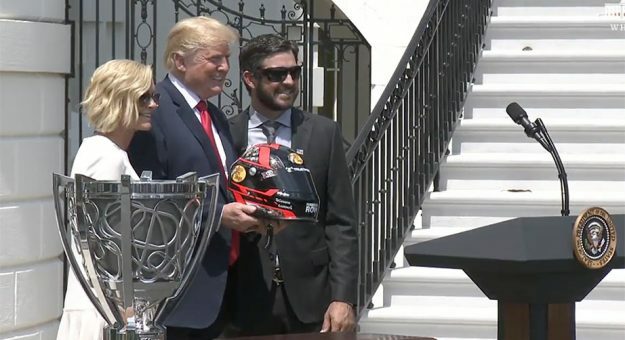 Truex was joined by longtime girlfriend Sherry Pollex, members of his Furniture Row Racing team and NASCAR senior executives on the South Lawn. The Monster Energy Series champion’s trophy and a display version of Truex’s No. 78 Toyota were stationed alongside. Trump then recounted details of the championship march for Truex and the No. 78 team, including its eight wins, its 2,000-plus laps led and its often personal fight through adversity. That included mention of Pollex and her campaign to raise awareness and funds in her personal battle against ovarian cancer. Truex presented Trump with a replica racing helmet with illustrations depicting some of the team’s special moments. Trump then invited team members up for a group photo. The ceremony ended with the White House band playing a rendition of “Rocky Mountain High,” a nod to Furniture Row Racing’s home in Denver, Colorado.